The Knights win the event for the first time since 2011, the last time they won the Class A state championship. 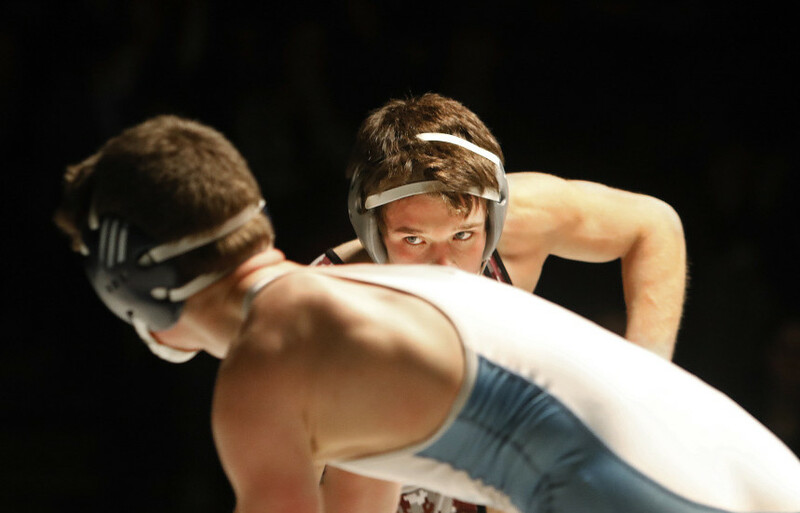 NORTH BERWICK — The last time Noble High won its own wrestling invitational was 2011. That was also the last season the Knights won the Class A championship. The Knights stopped one losing streak Friday, winning the 35th annual two-day Noble Invitational with 188 points. “It’s been a long time. That’s kind of painful but this is definitely a good step for us,” said Coach Kip DeVoll. Jake Martel and Austin Shorey claimed titles at 132 and 145 pounds, respectively, for Noble. But other teams – notably runner-up Sanford (157.5 points) and third-place Mt. Ararat (151) – showed improvement. Sam Anderson of Sanford was named the most outstanding wrestler. He won the 160-pound class, arguably the toughest division. Anderson edged Zack Elowitch of Portland 1-0 in the semifinal and beat David Wilson of Nokomis 8-6 with a late takedown in the first overtime in the final. While Noble is strongest at the middle weights, Sanford had six wrestlers place in the six heaviest weights. For Mt. Ararat, which also had six top-six finishers, the unquestioned leader is Robert Hetherman. He pinned his way to his fourth Noble Invitational title, stopping Michael Wrigley of Wells in the 170-pound final. Hetherman was fourth at the New Englands as a junior and has more than 160 career wins. For now, Sanford, Mt. Ararat, defending champion Skowhegan (which finished seventh) and the rest of Class A are chasing Noble. Where Marshwood fits is still to be determined. The Hawks weren’t at the Noble Invitational. Martel won a tough match against a two-time Vermont champion, Dan Bliss of Mt. Mansfield Union, 9-6. Shorey won his final by forfeit, raising his season record to 27-0. With 191 career wins he’s closing in on the state record of 212 set by four-time state champ Cody Hughes of Marshwood from 2012-15. Shorey will have company in that chase. Cody Craig of Skowhegan, who won his fourth 106 title, and the poised and strong Caleb Austin of Mountain Valley, the 126 winner, are well within reach of 200 wins. The same goes for Bradley Beaulieu of Marshwood, who won the Lowell Invitational 138-pound title Wednesday. Among Class B teams, Mountain Valley was the top finisher, tied for eighth with Wells just three points back. The Warriors had championship efforts from Nolan Potter at 195 and Sean McCormack Kuhman at 220. Other Maine wrestlers to win championships were Brenden Bruns of Belfast (113), Richard Oberg of Skowhegan (120), and Quinton Richards of Nokomis (152). Because of Thursday’s snowstorm that stretched into Friday morning, a handful of teams decided not to compete, and when wrestlers arrived Friday morning, they were greeted by a lengthy power outage. “We were about 10 minutes away from having to call it,” DeVoll said. Of the 21 schools that did participate, 13 were represented in the final. That included the one-man team of 285-pound champion Eric Pilcher from prep school Tilton (New Hampshire.) Academy. Pilcher grew up wrestling in the Noble youth programs and was a state qualifier for Noble as a freshman. Last season he won the Class A New England prep school title. “They let me wrestle in the tournament, which was nice. I was glad I got to wrestle in it this year,” Pilcher said.